Nowadays, the supermarket sells fresh fruits and vegetables year-round. Freezers keep meat, vegetables, bread, and other items fresh and safe to eat for months at a time. Canned goods can be kept for years, and many dry goods, such as oatmeal and flour also have a long shelf life. Have you ever wondered what people did in the time before refrigerators or canned goods? How did they keep their food fresh and safe? This challenge has daunted mankind for thousands of years and we’ve come up with some pretty good solutions. Drying was one of the first methods for preserving food. Ancient Egyptians used salt and the hot sun to remove moisture from food, making it safe to eat later. All sorts of foods can be dried, including meat, vegetables, and fruit. Native Americans ate pemmican, a mixture of dried meat, dried fruits, and fat. Jerky is a type of dried meat; raisins are nothing more than dried grapes. Pioneers strung green beans, onions, and other vegetables to dry, storing them in the attic. Smoking meats is another old way of preserving it. In Little House in the Big Woods, Laura Ingalls describes her father’s smoke house—a small wooden hut where he hung salted meat, keeping a smoky fire beneath the meat until it was dried. Many homes had cold cellars or root cellars under the house. These cellars were usually reached from a door on the outside of the house. Stairs led down into a small, dark, cool room. Here families stored apples, onions, carrots, squash, and other vegetables over the winter. A larder was often built on the north side of the house next to the kitchen. In this unheated room, foods were kept cool on stone shelves. In particular, this was the place to store butter, cheese, and meat. Some crops, such as carrots and turnips, can be left in the garden for months at a time if they’re covered with a layer of straw. Pumpkins and squash will last a long time if they’re stored in a cool, dark attic or cellar. These methods allowed families to have fresh vegetables in the dead of winter. Pickling foods like cucumbers, cauliflower, and cabbage in a salt brine preserved it and gave it a sharp, pungent flavor. Workers cut huge blocks of ice out of frozen lakes in the winter, storing the ice in buildings insulated with sawdust. The chunks of ice were used in the summer to keep food cold. All these methods allowed people to survive long winters when fresh food was hard to come by, but the methods weren’t perfect. Food poisoning was a common problem. 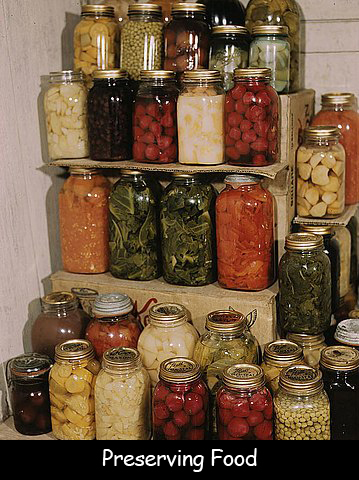 In the 1800s, several scientists developed new methods for preserving food. During the Napoleonic Wars, Napoleon offered a prize of 12,000 francs to anyone who could invent a better way to preserve food (he was looking for a good way to feed his troops). In 1810, Nicolas Appert, a French chef, won the prize after he discovered that heating food could make it safe. He sealed foods in glass jars with a cork and wax, wrapped them in canvas, and boiled them. In 1812, Brian Donkin tried canning food in tin cans instead of glass. Limited technology made the tin cans very expensive to make and the can opener hadn’t been invented yet—so tin cans didn’t really catch on until later. Mason jars were later invented. These jars were capable of being heated to high temperatures without breaking. Question: Were these early canned foods really safe? Answer: Mostly yes. Canned goods found on a steamer boat that sunk 100 years ago were completely free of bacteria. They smelled and looked horrible, but they were safe to eat. On the other hand, if people canning foods at home weren’t careful, they could end up with unsafe food. Would you like to try canning food? Here’s an article to get you started. Declan, Tobin. " Fun Facts for Kids about Food Preservation ." Easy Science for Kids, Apr 2019. Web. 23 Apr 2019. < https://easyscienceforkids.com/preserving-food/ >.